Assessing performance of extracellular neural spike detection is difficult [0,0]. We use signals recorded simultaneously intra- and extra-cellularly from a target neuron in rat hippocampus (Buszaki lab: http://www.crcns.org). The extracellular signals contain spikes from the target neuron (the concurrently recorded intracellular signal) and neighboring active neurons plus additional noise. Spike detection is difficult since spikes appear randomly, extracellular spikes are not always of higher amplitude than noise, extracellular electrode/target neuron geometry varies resulting in different spike shapes, spikes may be superimposed, spike shape varies due to noise (signals from distant neurons) and spikes from nearby neurons may be similar to the target neurons spike shape. Almost all spike detection techniques [0,0] use thresholding after applying signal processing. In recent work , we process the extracellular signal using Cepstrum of Bispectrum (a higher order statistics technique) followed by wavelet transformation. The proposed technique (cob) was assessed using simulated signals and gave outstanding performance compared to four established methods: more than 99% of spikes were detected from simulated extracellular signals at 0 dB SNR. Here, we examine the performance of cob on real extracellular signals. We observe the performance of cob on detecting the target neuron's intracellular spike events in the extracellular signal. Performance was assessed from 64 data files (using 1 intra- and 3 extracellular signals) from different rats. All signals are first high-pass filtered (cut-off frequency 300 Hz: Butterworth filter of order 8), then assessed visually for signal quality and presence of artifacts. Intracellular signals are simply thresholded (the SNR is high). Marker events were discarded. Detected intracellular spikes are the target neuron's spikes (ground truth). First, we examine the extracellular signal for ± 1 ms from the time of the ground truth spikes seeking visually a consistent template for spikes corresponding to ground truth. We classify the extracellular signal into 3 categories. Type 1: the amplitude of ground truth spike (A GT ) is higher than neural noise, Type 2: A GT is equal or less than the amplitude of neural noise and Type 3: there is no consistent shape from the ground truth spike. Here (unlike in ), we use an iterative cob process (3 iterations)  where before each iteration, we modify the test signal by setting it to zero for ± 1 ms around identified events. We apply cob on 5 s segments of the original signal. In the iterative cob process, the threshold level is set to 5% of the peak "cob processed signal." 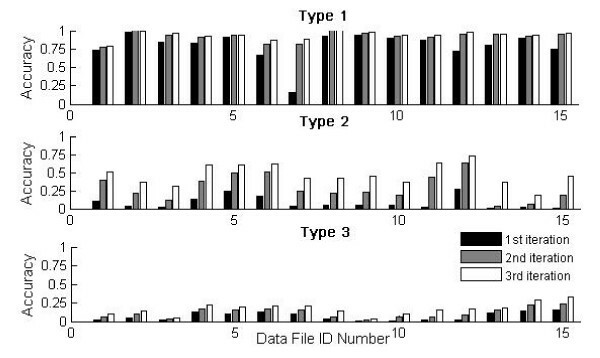 We show three bar graphs (Figure 1) depending on signal type. For each type we show the accuracy of the cob technique after applying the 1st, 2nd and 3rd iterations (black, grey, white bars). On the Type-1 signal, the first iteration identifies most of the spikes, except for file 7 that required a 2nd or further iteration to achieve this. For Type-2 signals, the 2nd and 3rd iteration of cob considerably improves performance: many additional (non target neuron) spikes are found. For Type-3 signals, the maximal accuracy obtained (which is about 25%) is at the cost of finding many non-target neural spikes. Using a lower threshold enables detection of all target spikes, but at the cost of non-target detection and false positives. The repetitive cob process enables the use of a higher threshold level, finding target neurons with many fewer false positives. We acknowledge the support of the UK EPSRC, grant number EP/E002331/1 (CARMEN).